Gangaur festival occupies a very prized place in the culture of Rajasthan. This is one festival which is celebrated in all parts of Rajasthan with great enthusiasm. This festival starts on the day of Holi (the festival of color) and stretches to the next 9 days. Celebrated in the months of July-August, the festival marks the advent of monsoon and harvest. And it is also a celebration of ‘marital fidelity'. Womenfolk are the main participants in Gangaur Festival. Idols of Isar (Lord Shiva) and Gaur (Goddess Gauri—Lord Shiva's consort) are worshiped by the women. They take delight in making clay idols of the divine and offer prayers to them. It is believed that this festival brings with it the hope that the married lives of the women remain harmonious. The married women offer prayers to the goddess Gauri (symbolizing marital bliss) for maintaining peace at home and a good relationship with their husbands. They also pray for long life of their spouses, whereas the unmarried girls offer prayer for a husband like Lord Shiva. 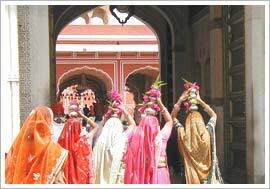 Gangaur festival is celebrated with great passion in the royal families of Rajasthan. Beautiful idols of the divine are made and professional painters are called to paint them. The royal women call ladies expert in applying mehandi (henna) to decorate their hands with sacred red color of mehandi. According to a popular perception in Hindu tradition the darker the red color of your mehandi, the more adorable you are to your spouse. Women take out processions in the street during the festival. They sing traditional songs dedicated to the divine. They decorate the idols of the divine with colorful clothes and beautiful jewelry. On the last day of the festival the women bid farewell to the idols of the divine by ending the procession with the consignment of the idols in the waters of the pond or lake. Ghawer is the famous sweet of Rajasthan which is distributed on the occasion of the Gangaur festival.